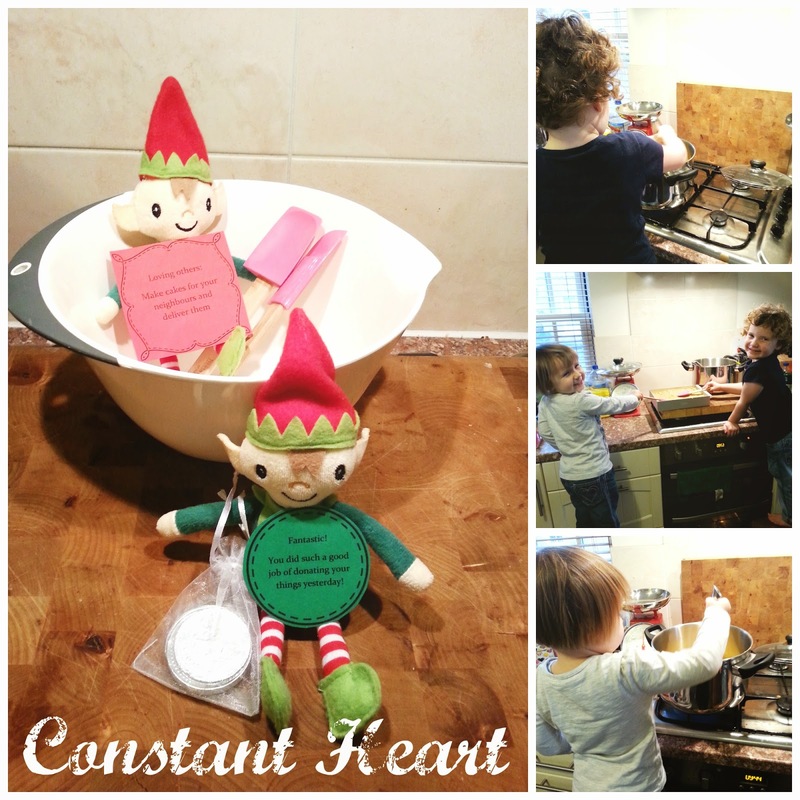 Yesterday, Day 2 of our Kindness Elves adventure, was a little trickier! Not because the task itself was difficult, but because it was combined with 3 under 4's who were each having regular meltdowns!lol! Our task was about Loving Others - to make some cake for our neighbours. We have yet to deliver it as it was raining all day yesterday!! I wanted to show a difference between being kind to our friends who live very close by, and people that we don't really know. The plan is to leave them wrapped on the doorstep of our neighbours house with a little note inside saying "From Erin, Lara, Caleb, and the Kindness Elves @ *our address". We are really blessed to have lovely neighbours, and the estate we live on is fairly new so we have been able to meet a number of people on our road as they've moved in. We made some flapjack together, and the children enjoyed a chocolate coin the Elves had left along with a green well done token for their charity donations the day before. I think Erin found it funny that they were set up ready to go! I do think that we are on the very limits of being able to take part - Erin understands enough of what we're doing but they are mostly just enjoying the activity that's planned. They activities do allow for a purposeful conversation about kindness regularly so it can't be a bad thing! I'm not going to lie, there were trying moments when out of frustration I threatened the Elves to go back to the North Pole if they didn't see the children being kind to each other!lol! It wasn't the intention but it did have the desired effect - I won't be saying it again though, it defeats the object of what we are doing: trying to foster kindness and thinking of others. Today's task is a little simpler and focusses on Loving Our Family! If you want to get more updates on what we are doing, come over and find us on our Facebook Page. Be sure to Like us to continue getting updates!